1 What is a responsive or mobile-friendly website? Did you know that more than 50% of traffic to websites comes from mobile phones? Did you also know that in early 2016, Google changed its SEO ranking algorithm so that mobile-friendly websites were ranked higher than desktop-only websites? A responsive website is a mobile-friendly website. There are multiple ways to have a website look and interact well on small screens such as mobile phones and tablets. For a while, the only way was to have a completely different website – one for mobile and one for desktop computers. Having two websites created problems when a change needed to be made, because it had to be made in two locations. It also created frustrations for users on mobile devices who wanted to do things on the website that the mobile version didn’t allow. The latest trend is to use responsive design, which is a fluid way of laying out the elements on your website so that no matter how you resize the screen, it looks great without sacrificing important functions of the website. It doesn’t require content updates on multiple websites, because there is just one website for mobile and desktop. For example, take a look at the following screen shots. The first screen shot is from a desktop. The second is from a smaller screen. We only develop responsive websites, because they are flexible and do not require any extra work in updating the content. They always look great on every screen size and ensure the websites we create age well over the coming years. 2 Why do I need a responsive website? If you want a new design for your website, there’s no reason not to go with a responsive WordPress theme. Most purchased themes are responsive, and if we create a custom theme for you, we highly recommend that we build it responsively. (For more reasons, please see the previous question, “What is a responsive or mobile-friendly website?”). If your current site design still fits your business but is not mobile-friendly, we can convert it to a responsive WordPress theme. How do you know if your site is mobile-friendly? Google has made it easy for you by providing a mobile-friendly test. Just click on this link: test page. Type in your URL and click “Analyze”. If your site isn’t mobile-friendly, please contact us to discuss your options for creating a mobile-friendly website. 3 Why can’t I have a new website tomorrow? I know we make it look effortless, but great design and development take time – a lot of it. We spend a lot of time researching and listening to you as we determine what design and content best fits your business. We spend a lot of time perfecting the design and fine-tuning the content. We spend even more time developing your website so that it functions perfectly, every pixel is perfectly placed and the content is as easy to add and edit as possible. Call us perfectionists, but we know that when we’re done, you’ll be blown away by the quality and craftsmanship of your website. So back to your question – sure, you can set up a new website in an hour on SquareSpace or have your neighbor’s teenage son create a website for you, but the time and headaches you’ll encounter later aren’t worth the time and cost savings. Our typical time frame is 2-3 months depending on the complexity of the content and design, and this is half the time of the industry standard. Contact us today to get started. 4 How can I get onto the first page of Google? So you have a brand-new website, and every day you anxiously search your business name on Google waiting to see your website on the first page. We have bad news for you. Most likely, you’ll be waiting for a while. Google’s Search Engine Optimization (SEO) ranking algorithm is extremely complex, and we mean “extremely.” There are a number of different factors that go into how Google ranks your website for key search words. One of those factors is the amount of times someone searches on a particular word or set of words and clicks on your website. The more people click on your website for a set of keywords, the higher your ranking. As you can imagine, this takes time. There are a number of things you can do to help your SEO rankings, and we encourage you to do what you can within your allotted budget. The first thing we often do is install a WordPress plugin that allows you to add keywords and descriptions for every page. This helps Google know what content to expect on each page. The second thing we do is submit your website sitemap to Google for crawling. If you require more than this, we highly recommend you contact an SEO professional to help you find more ways to increase your SEO rankings. We are happy to work with your SEO professional. 1 My site has been hacked! Can you help? Absolutely! We wish we could say that we’ve never had to clean up a security breach, but we’ve had experience with many different types of breaches. We’ve partnered with a security firm that will provide the cleanup for us. We manage all contact with the firm and ensure it’s completely cleaned up. All you have to do is contact us and let us know the nature of the security breach, and we’ll take it from there. You can go back to doing what you do best – running your business – and we’ll let you know when your site is clean (usually within 24-48 hours depending on the depth of infection). Finally, we will make recommendations on how to prevent a future attack from happening. We know a hacked website can be frustrating, so let us handle it. 2 My website is slow. Can you help? Absolutely! There are a number of reasons why a website may be slow. Through a series of tests, we are often able to isolate the problem and make recommendations on how to fix the issue. Sometimes the issue is with the WordPress theme itself, in which case you may need a new design. But more often than not, we’ve found the culprit to be too many plugins. Simply by uninstalling a few plugins, the problem can significantly improve. Another reason why a website may be slow is the hosting environment. Your current host may not be a good fit for the number of users visiting your website or the amount of photos or videos you have on your website. If that’s the case, we would be happy to copy your website over to our server and do some speed tests so you can see if moving your website to our server would help improve your website speed. We have also found that some clients have unrealistic expectations about how fast their website should load. You may notice that websites like Amazon load almost instantly. That is because they have a really large budget and spend a lot of money on their hosting environment to make sure their website loads quickly. Unless you have the budget of Amazon, your website just won’t load that fast. We are happy to have a look at your website and let you know if there are ways to improve your website speed. Please see our à la carte prices page for speed analysis pricing and contact us today. 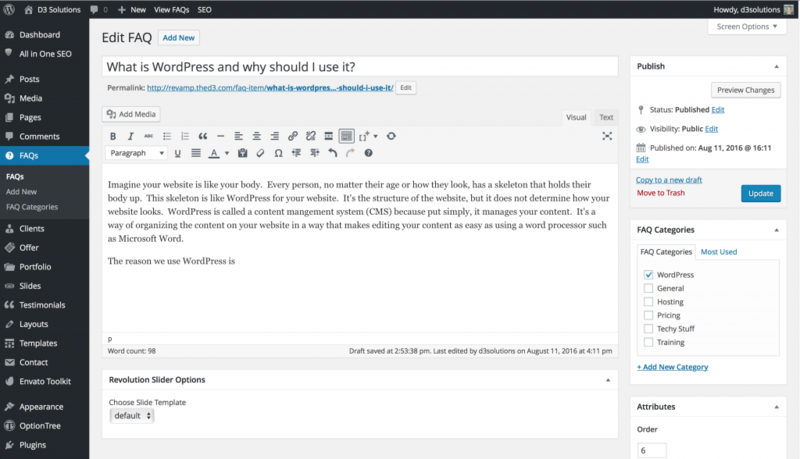 1 What is WordPress and why should I use it? 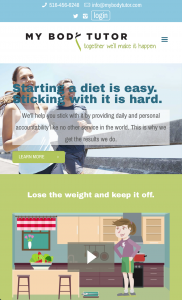 Imagine your website is like your body. Every person, no matter their age or how they look, has a skeleton that holds their body up. This skeleton is like WordPress for your website. It’s the structure of the website, but it does not determine how your website looks. WordPress is called a content management system (CMS) because it manages your content. It’s a way of organizing the content on your website in a way that makes editing your content as easy as using a word processor such as Microsoft Word. Take a look at this screen capture below to see what WordPress looks like behind the scenes AKA the WordPress backend administration. There are a number of reasons we use WordPress and why we think it’s a good fit for all our clients. It’s open source which means it’s free to use and has a large community of very talented, knowledgeable people maintaining the code. It’s easy to use even for a non-computer person. Once we give you your set of training videos, most clients have been pleased to find out just how easy it is and are excited to have the ability to make edits to their website content themselves. It’s flexible. This, perhaps, is the greatest strength of WordPress. We have not found a website yet that didn’t work using WordPress. There are thousands of ways to expand the core features of WordPress and we have achieved every dream a client has brought to us. It’s a chameleon. You can create thousands of different designs that work with WordPress so no two websites look exactly alike – just like people. And we could go on, but we’ll spare you. We would be happy to discuss your needs further to determine if WordPress is a good fit for your business. Contact us today. 2 What is a WordPress theme? In the previous question, we had you imagine that your website is like a body and that every body has a skeleton that gives it structure and holds it up. This is like WordPress for your website. It contains all the content of your website and organizes that content so it’s easy to edit. A WordPress theme is like the clothes your website wears. Just like clothes, you can easily change the way your website looks simply by switching themes. While we don’t recommend changing the theme of your website as often as you change your clothes, the normal shelf life of a theme is around 3 years. Once the theme starts to look outdated, we simply create or install a new theme and your website is instantly refreshed with a minimal amount of changes to your content. WordPress themes come in three flavors: free, purchased for a nominal fee (usually under $100), and custom. For more information on these options, please see the next question. 3 What is the difference between a purchased theme and a custom theme? For some people, money is no object, but for the rest of us, the reality is we have a limited budget. Purchased themes are a great way to save money without sacrificing style. When you purchase clothes, for example, you can choose a store with cheaper clothing that works with your budget. Or, you can choose a high-end store with more expensive clothing that lasts longer and looks better. Finally, you can go to a tailor and have him custom-make clothing just for your body that fits perfectly with your style. So it is with a WordPress theme. There are a large number of WordPress themes that are free, but we recommend purchasing one from a developer with a high ratings to ensure you are getting a good quality product. This is a great way to save money but still get a high-quality, long-lasting theme that looks great. If you really want that custom look and are willing to pay more for it, then a custom theme is the perfect way to go. Peachtree Catering and Passion8 are excellent examples of custom themes we have created for clients. No matter what you decide, we can help you every step of the way as you make the decision that is best for your business and your pocket book. We can start from a purchased theme and customize it so that it looks anything but “cookie-cutter” or we can design something completely custom for you. That’s why we love WordPress – it’s so flexible and there are so many options for making it look great. 4 What are the steps to purchasing and customizing a theme? If you choose to save money by purchasing a theme, we are with you every step of the way to ensure the theme we purchase is a great fit for your content and your brand. Here is a rough guideline for how we help you choose a WordPress theme. We evaluate your current website and any printed material you may have to understand your business, your brand and your website content. We have you fill out a questionnaire where you share with us what you want out of your new website and what look you want to achieve. We look through some premium WordPress themes and select 3-5 to show you. We help you evaluate each of them and together we make a decision which theme to purchase. We will purchase the chosen theme for you and install it on a testing server . The next steps depend on whether you want to spend a little extra money and have a designer make some custom changes to the theme or if you would like to save some money and stick close to the chosen theme. 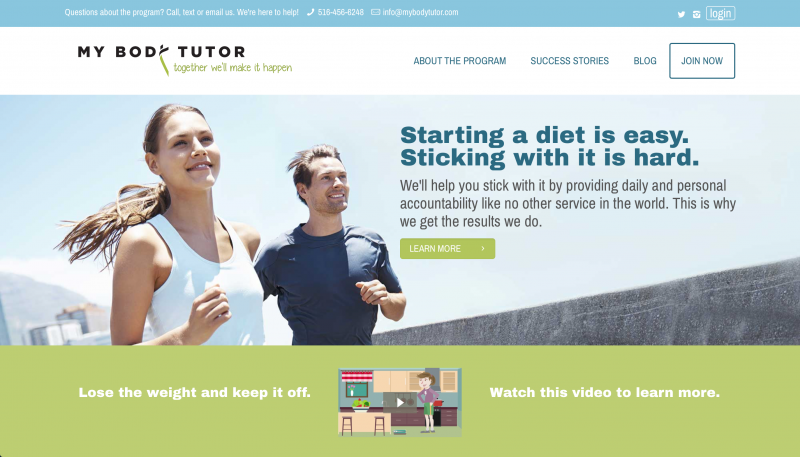 For example, MyBodyTutor used the BeTheme WordPress theme, but they paid more to have Tucker Design & Co. do 7 page designs. The custom style is clearly evident in the design of the website which doesn’t look like any of the pre-built websites on the BeTheme demo. Another one of our clients, Van Popering Insurance, had a limited budget and didn’t want to use a designer. We chose the Finanza theme and then customized the look to their brand as closely as possible given the confines of the theme. If you choose to use a designer, here are the next steps. The designer will at a minimum create 2 home page designs for you to choose from, and we will have 2 rounds of edits for the chosen design to get it exactly right. If you would like even more personalization, we can design a few more pages for an additional price. We will identify these key pages and provide one design for each page identified. Again, we’ll have 2 rounds of edits for the chosen design to get it exactly right. Once the designs are finalized, we will take the designs and start making changes to the theme to reflect the design perfectly. Once the changes are made, you and the designer will be given 2 more chances to look through the site and make design changes. After all the content is inserted, you and the designer will be given one last chance to go through the site and ask for changes. If you chose NOT to use a designer, here are the next steps. We will make color and font changes as needed to reflect your brand, upload your logo and make any other changes we think are necessary. We will give you a chance to review the site and ask for changes. Once all the content is inserted, you will be given one last chance to go through the site and ask for changes. 5 What are the steps to creating a custom theme? If you want a theme custom-made for you, there are three ways we can work with you. You can have another company create a design for you, and you can send us the Photoshop files they produce. You can choose a designer, and we will work together on the design. We will partner with Tucker Design & Co. to create your design. We will, at a minimum, create 2 home page designs for you to choose from, and we will have 2 rounds of edits for the chosen design to get it exactly right. If you want a few more pages designed (which we highly recommend), we will identify these key pages and provide one design for each page identified. Again, we’ll have 2 rounds of edits for the chosen design to get it exactly right. Once the designs are finalized, we will take the designs and create the theme to reflect the design perfectly. Once the theme is created, you and the designer will be given 2 more chances to look through the site and make design changes. 6 If I use WordPress, will my website look cookie-cutter? Absolutely not. We work hard to ensure that your theme is unique and reflects your brand. We can make your website look any way we want. For more information on this, please see the FAQ “What is a WordPress theme?”. 7 What is a WordPress plugin? A plugin is like a tool or resource a person may use to get a job done. We aren’t born with smart phones in our hands, but we’ve learned that we can be more productive if we have one. So it is with plugins and WordPress. Plugins can easily be installed to add special functionality to WordPress that doesn’t come out of the box. For example, while WordPress is set up to be SEO friendly, it doesn’t contain special SEO features that would allow you to set up keywords and descriptions for each page. Therefore, we install an SEO plugin that adds that functionality. Another example would be a plugin that inserts the ability to add a home page slider. WordPress isn’t built with this functionality out of the box, so a plugin adds this ability. Plugins are really handy tools that allow you to tailor your website to do exactly what you need it to do and no more. If WordPress came out of the box with every function imaginable, the code would be so bloated and heavy that websites would run extremely slowly. The use of plugins ensures you aren’t getting more than you need. But just as a smart phone can be put down when it isn’t needed, a plugin can be uninstalled if it is no longer useful. A WordPress site can have a limitless amount of plugins, but we recommend no more than 20. We’ve found that the speed of a website starts to decrease significantly when more than 20 plugins are used, and that more often than not, some of the plugins aren’t being used and can easily be uninstalled. If you feel like your website is slow, your plugins may be to blame. We are happy to have a look at your plugins to see which ones are negatively effecting your website speed and recommend how this can be fixed. Contact us today. 8 I’ve heard WordPress isn’t secure. Will my website get hacked? Did you know that 26.4% of the Web is run on WordPress? Security is a hot topic these days, and WordPress is at the center of it simply because it’s grown to be so largely used. Hackers like to expend their energy on targets that will give them the most bang for their buck, and WordPress is one of those targets. There isn’t a single website out there that is 100% secure, but there are significant ways to reduce your risk of a security breach – especially if you’re using WordPress. We take security seriously, so we take multiple approaches to significantly reduce our clients’ risk. We educate our clients on the use of strong passwords so that password-guessing algorithms can’t easily find their way into the backend administration for WordPress. Did you know that many people don’t change the default username from “admin” and will often use a password such as “1234admin”? These are the websites that will get hacked. Your risk is signficantly reduced if you create a strong password for all users. We install a number of security plugins that prevent attacks. Since we use more than one, we cover our bases on multiple fronts. We also get notified immediately if something fishy is going on. If you host with us, we have implemented many security features directly on our server. This helps keep the bad guys out before they even get to your website. If you host with us, we do all backups and updates as part of our hosting service. Outdated WordPress files are an invitation for a security breach. Every week we create backups of all the websites on our server, and we update all WordPress core files and plugins to ensure any security holes are patched as soon as an update is available. We partner with a security firm that provides us with a website firewall and monitoring service. While this service costs extra, many of our clients have found it invaluable for protecting their websites from a security breach. Rest assured we have spent a lot of time making our server a secure environment and every WordPress website we create as secure as possible. We are happy to discuss security measures in detail if you still have questions. Contact us today.